If we could only take that trip back in time and erase the memories we don’t want to keep. 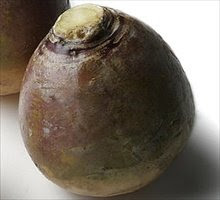 I would vote to erase the bad memories of Rutabaga, or, “Swede” as we call it back in the UK. Rutabaga is not well understood. Kind of like that weird relative at Thanksgiving dinner – the one who has that odd sense of humor and brings that Jell-O vegetable roll thing that no one eats. Who does that to vegetables anyway? That’s a lot of therapy right there! Unlike that Jell-O vegetable roll, however, rutabagas are fabulous. They have terrific color, and a flavor that can’t quite be defined. The rutabaga is actually a hybrid of a turnip and a cabbage. Don’t hold that against it, since it tastes like neither. The flavor combination, like any relationship, is complicated - simultaneously sweet and slightly bitter. Rutabaga is a refreshing substitute for the humble potato. Discerning chefs often transform rutabaga into gnocchi, replacing the potato. Rutabaga’s flavor pairs well with gamy meat such as rabbit, or with shellfish – shrimp, or lobster. My favorite prep method for rutabaga is to peel, chop into rough cubes, steam and puree. I add a touch of heavy cream and a dash of sweetness such as maple syrup, agave nectar, or brown rice syrup. Mix in a pinch of spice such as cumin, cayenne pepper, or paprika and, “Bon Appetit” – a simple, nutritious soup or thrilling pasta sauce. The heavy cream can be substituted for a thick, non-dairy milk such as coconut milk for a Vegan option. In this case, the soup/sauce mix will need to be reduced somewhat to thicken. Don’t be put off by a wax coating (or, horror, saran wrap!) on the rutabaga, when seen at market. It is the produce vendor’s attempt to prevent the vegetable from drying out in storage. Properly stored, in a cool, dry place, rutagaba will keep for months. Rutabaga is loaded with potassium and vitamin C. Just the thing to build strong muscles and strengthen our immune systems at this time of year. Grab rutabagas while you still can at market. They will soon disappear awaiting a return in the early fall. Have fun with rutabaga. Experiment. Eat well. It’s Good For You! Nice...I have never known what to do with a rutabaga.